[153 Pages Report] Coating Pretreatment Market size is estimated to grow from USD 2.89 Billion in 2016 to USD 3.83 Billion by 2021, at a CAGR of 5.76%. The coating pretreatment industry is witnessing high growth because of increasing applications, growing demand for powder coatings, and its rising demand in developing countries. Coatings pretreatment are largely used in the automotive & transportation applications. Rapid growth of the coating pretreatment market is driven by increasing demand from its end-use industries. The report covered the market by type such as phosphate, chromate, chromate free, and blast clean; market by metal substrate such as steel and aluminum; and the market by applications such as automotive & transportation, building & construction, and appliances. This study aims to estimate the market size of coating pretreatment for 2016 and project its demand by 2021. It also provides a detailed qualitative and quantitative analysis of the coating pretreatment market. Various secondary sources such as directories, industry journals, and databases have been used to identify and collect information useful for this extensive commercial study of the market. Primary sources such as experts from related industries and suppliers have been interviewed to obtain and verify critical information as well as to assess prospects of the market. The coating pretreatment value chain includes raw material suppliers, coating pretreatment manufacturers, and end users. Maximum value addition is done during the manufacturing stage of coating pretreatment. The major companies involved in the value chain of coating pretreatment market are Chemetall GmbH (Germany), Henkel AG & Co. KGaA (Germany), PPG Industries (U.S.), Nihon Parkerizing Co., Ltd. (Japan), Nippon Paint Co., Ltd. (Japan) and others. “The study answers several questions for the stakeholders, primarily, which market segments to focus on in the next two-to-five years for prioritizing efforts and investments and competitive landscape of the market”. The coating pretreatment market is estimated to reach USD 3.83 Billion by 2021, at a CAGR of over 5.76% between 2016 and 2021. The drivers identified for the market are growth in application areas, increased demand from end-use industries, and growing demand from developing nations. Automotive & transportation is the largest application of coating pretreatment. The construction industry is driven by rising urbanization in Asia-Pacific and the Middle East & Africa, which has resulted in increased demand for residential, commercial, and industrial infrastructure. Low interest rates on housing loans are also responsible for increase in the demand for new houses, eventually driving the building & construction application of coating pretreatment. The chromate free type of coating pretreatment is growing at the highest rate among all the types of coating pretreatment. The demand for chromate free coating pretreatment is expected to increase in the future owing to their non-VOC emission properties, thus providing high growth opportunity to the overall coating pretreatment market. Stringent government regulations in the U.S. and Europe, especially to reduce air pollution, will trigger the need for adopting new, low-pollution coating technologies. The chromate free pretreatment coating are nowadays used as a substitute of chromate-based pretreatment due to its environmental friendly nature. It also adheres to the regulations of REACH and other institutions. It is the fastest-growing market among all types of coating pretreatment in Europe and North America. It is used for pretreatment of aluminum and light alloys. The growth is mainly attributed to its ecofriendly nature as these are based on titanium and zirconium chemistries, and they are less harmful and eco-friendly in nature. Currently, Asia-Pacific is the largest market for coating pretreatment, both in terms of volume and value, followed by Europe and North America. Countries such as the U.S., China, and Germany are the major markets of coating pretreatment. Due to the increasing demand on domestic front, rising income levels, and easy access to resources, Asia-Pacific has emerged as the leading market of coating pretreatment. South America, especially Brazil, has also emerged as a key market for coating pretreatment manufacturers. Not only is the demand for coating pretreatment expected to be strong in Brazil, but its proximity to the U.S. makes it an emerging market for setting up production facilities. Low demand of coating pretreatment and its application industries in developed countries are restraining the growth of the coating pretreatment market. 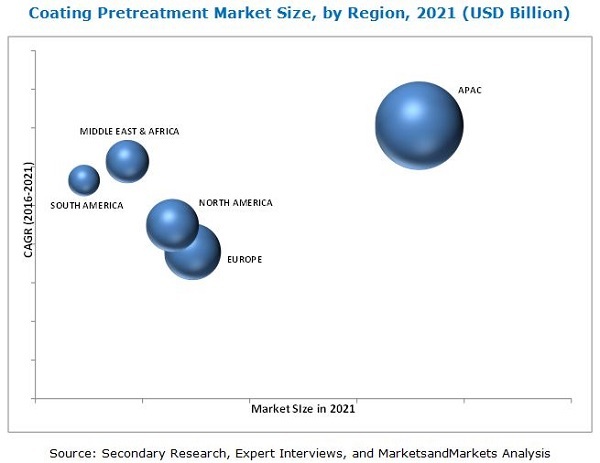 The coating pretreatment market is highly competitive, with key market players, such as Chemetall GmbH (Germany), AkzoNobel N.V. (Netherlands), Axalata Coating System LLC (U.S.), PPG Industries (U.S.), Henkel AG & Co. KGgA (Germany), Sherwin-Williams Company (U.S.), and Nippon Paints Co. Ltd. (Japan), having a sizable share in the global market. New product launches; agreements, partnerships, and joint ventures; expansions; and mergers & acquisitions are some of the key strategies adopted by the market players to expand their global presence and product portfolio. Maximum number of market activities took place in 2015. The leading players, such as Chemetall GmbH (Germany), PPG Industries (U.S.), Nippon Paints (Japan), and Henkel AG & Co. KGgA (Germany), contributed mainly in terms of number of developments. New product launches and mergers & acquisitions are the key strategies adopted between 2013 and 2016. 13.4 Nihon Parkerizing Co., Ltd.
13.5 Nippon Paint Co., Ltd.
13.10 Kansai Paint Co. Ltd. I am researching the volume usage of non-chrome coatings pretreatments for automotive and aerospace markets out to 2020Any help would be a big help.